Protect your business from web-borne malware and misused bandwidth. The Barracuda Web Security Gateway lets organizations benefit from online applications and tools without exposure to web-borne malware and viruses, lost user productivity, and misused bandwidth. As a comprehensive solution for web security and management, it unites award-winning spyware, malware, and virus protection with a powerful policy and reporting engine. Advanced features ensure that organizations adapt to emerging requirements like social-network regulation, remote filtering, and visibility into SSL-encrypted traffic. Unlimited remote user licenses are included to enforce content and access policies for mobile and desktop devices outside of the corporate network. The Barracuda Web Security Gateway is also available as a virtual appliance. Increase productivity, regulate bandwidth usage, and prevent risky behavior by enforcing granular policies on user activities. The Barracuda Web Security Gateway can control access to web sites, applications, and Web 2.0 platforms based on users, groups, time, bandwidth, and other criteria. SSL-filtering and inspection capabilities provide policy enforcement on social-media and search platforms that are otherwise obfuscated. In addition to powerful on-board reporting, you can also deploy a Barracuda Reporting Server. The Barracuda Reporting Server is a powerful platform that enables unified reporting for Barracuda Web Security Gateways. 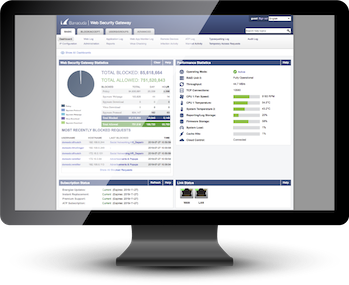 Designed to meet the demands of reporting on increasing amounts of user and security data, the Barracuda Reporting Server generates accurate, customizable reports in a fraction of the time that it takes built-in reporting engines, while also enabling aggregated reports for multiple connected devices. Centrally manage the Barracuda Web Security Gateway through the cloud. Configurations on the Barracuda Web Security Gateway are simple and easy-to-deploy ensuring customized network protection is in place in a matter of minutes.